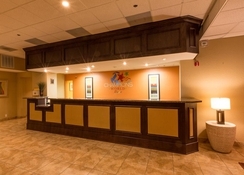 Champions World Resort is great budget accommodation located just off West Irlo Bronson Memorial Highway near Walt Disney World Resort in Kissimmee. With 435 guestrooms, the hotel can accommodate any family, large and small, and provides amenities that are hard to find in other hotels in the region. The hotel’s on-site restaurant, Frazier’s Place, serves great buffets, and the poolside bar Coconut's Shrimp offers relaxing drinks and light bites. It has an on-site sport complex, where one can play a game of one’s choice, and three heated swimming pools, one of which is covered. There is also a five-acre nature park, where the guests can take leisurely stroll or organize a picnic for their families. 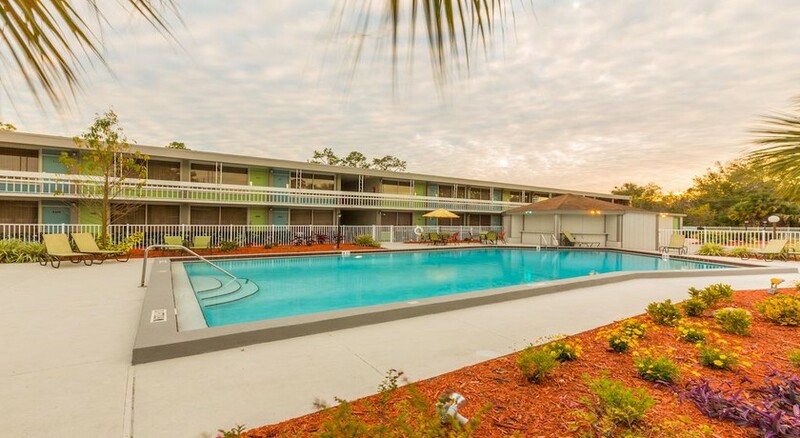 The location is ideal, for it is just a short distance away from some of the major theme parks of Orlando, including Walt Disney World, Universal Studios and SeaWorld Orlando. To make matters easier, the hotel provides free shuttle services to these theme parks as well as shopping malls such as Lake Buena Vista Factory Stores. 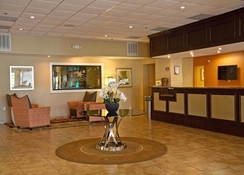 The hotel is ideally located in central Orlando near West Irlo Bronson Memorial High, a major thoroughfare in the city. The nearest theme park is Walt Disney World Resort which is located at a distance of 8.8 km from the hotel. A bit further away is Universal Studios’ Resort, which is 26 km from the hotel. The Orlando International Airport is situated at a distance of 43 km, and it takes about 30 minutes to reach the airport from the hotel. Champions World Resort is undoubtedly the best place to stay if you have a large company. 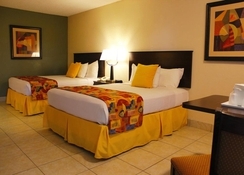 The spacious, non-smoking rooms come in a variety of types: standard, double deluxe, premium queen and premium king. 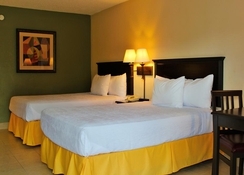 The hotel also has pet-friendly rooms, which can accommodate up to two pets. The premium king room is just steps away from the sparkling blue pool of the hotel. 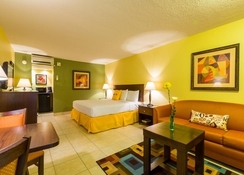 Room amenities include flat-screen television sets, refrigerator, microwave, free Wi-Fi, hair dryer, iron and ironing board, tea and coffee maker, electronic safe and so on. Frazier’s Place Grille & Lounge is the main restaurant within the hotel premises that serve breakfast, lunch and dinner, and the menu features everything from lip-smacking buffalo wings to juicy hamburgers. Within 10 dollars per person, you can avail their breakfast buffet every day. A-la-carte items are also available throughout the day. The poolside bar Coconut’s Shrimp is a great place to enjoy drinks and appetizers amid great music. From a sport complex to a nature park, the hotel has everything to keep you active throughout the day. Start your day with a refreshing dip in one of the hotel’s 3 heated pools, followed by a hearty breakfast. Take our shuttle to one of the many theme parks in the region to spend a fun-filled day with your family. End the day sitting by the pool and catching a movie on a giant screen. For sportier guys, there is huge sport complex, where you can enjoy a game of baseball or volleyball, and a nature park, which is ideal for picnics, jogging, hiking and so on. The 5-acre nature park feature picnic areas with barbecue grills, a gazebo and nature trails If you are planning on a business or social event, the hotel provides a number of hassle-free, all-inclusive packages. No complaints really stayed here for 2 weeks , nicely located for all parks, shops , the grounds where as pictures shown food in hotel was really good especially the stake and reasonable priced, not anything I could find wrong with the amenities all clean , will definitely be staying here again. Everything was good apart from the amount of time we had to wait for our evening meal. Was only one person working the bar/lounge and restaurant any so more staff needed I think.